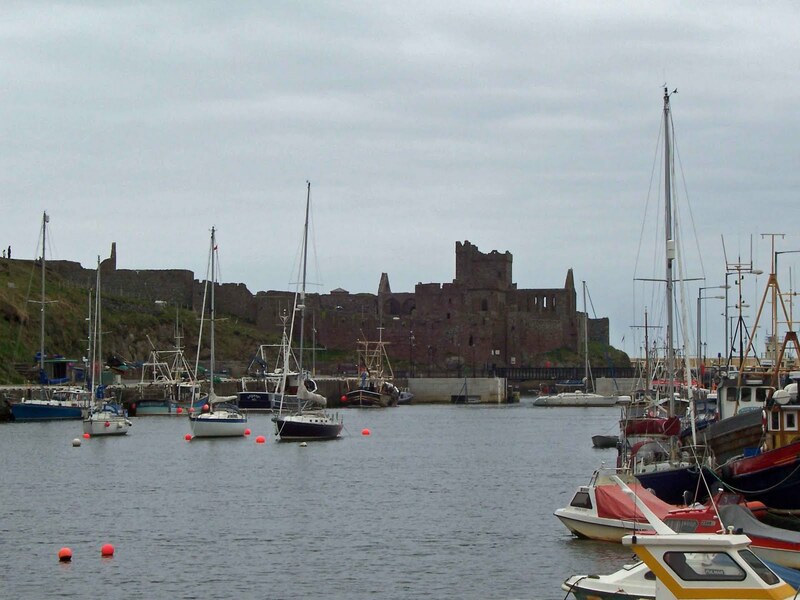 Peel lays on the West coast of the Isle of Man, about eleven miles West of Douglas. The town of Peel lays in the shadow of Corrins Hill, a long land mass that separates the town from the Irish Sea. The castle is built on St Patrick's Isle, a small island separated from the mainland, and accessible via a relatively modern causeway. Aerial views of the castle show a collection of roofless buildings, earthworks, curtain walls and a number of towers. Above. A view from East Quay, looking North towards the ruined castle and cathedral. Dating from the 11th century, the castle was built by King Magnus Barelegs, King of Norway from 1093 until 1103, King of Mann and the Isles from 1099 until 1102 and King of Dublin from 1102 until his death in 1103. The castle was built of wood at this point, and was built around the existing stone built monastic buildings that occupied the small island at this time. The ruined castle still incorporates the remains of the old cathedral of St German, which can be seen over the 14th century, red sand stone walls. It was used by the church as the administrative centre for the see of Sodor Diocese, until it was abandoned in the 18th century. The castle on the other hands was maintained right up until 1860, when it was updated and re-fortified to prepare for a possible French invasion. The castle is owned by Manx National Heritage, and is open to the public from April until October. Isle of Man Heritage web site.